The safety of post-tensioned structures is reliant on the integrity of steel tendons located in ducts within the main structural elements. This paper describes the key role MegaScanTM Imaging currently plays in the inspection system. The long-term safety, durability and performance of bridge structures mainly depend upon good detail design, the quality of materials used and the standard of workmanship achieved on site. Unfortunately, defects do occur in structures for a wide variety of reasons, ranging from poor detailing to a lack of maintenance. The investigation and assessment of defects is a demanding task which in many cases requires the use of experienced staff, supported where necessary by specialist inspection techniques. One such specialist inspection technique is the MegaScanTM Imaging Capture System, which is a capable radiographic non-destructive testing (NDT) process. MegaScanTM Imaging has been successfully employed in the investigation of various components within a diverse range of structures. Major improvement and development work carried out during the past five years have contributed to this success by yielding significant improvements both in system safety and imaging techniques. The MegaScanTM comprises four main components: - imaging head, power pack, control panel and capture plate. Figure 2: Planning - Site Survey. Health, Safety and Environmental considerations are of paramount importance when planning radiography and for which all parties involved must take appropriate responsibility. In all cases a site survey is undertaken by Material Measurements Ltd (MML) prior to the use of the MegaScanTM and where required, notification is sent to the Local Health and Safety Agency informing them of the intention to carry out radiography. This notification and any related safety issues are usually conducted by MML. The MML site radiographer also carries out a risk assessment and produces method statements for a safe system of work. Assistance is also available to incorporate these documents into other related site safety documentation. A safety plan is produced prior to carrying out inspection work. While this requires careful preparation in advance, it is nevertheless a simple but thorough operation. Safety plan production should not be seen as an obstacle, as similar work is commonly undertaken in the medical, general engineering and aviation industries. Most nations have strict guidelines laid down to cover safe working practices; in the United Kingdom such requirements are covered by the Ionising Radiations Regulations 1999. The latter for example require the use of a fully trained and experienced work force. The MegaScanTM imaging team meet such requirements and have undertaken such work for many years. 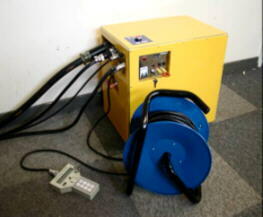 Due to the small overall size and portability of the MegaScanTM and the simple use of secondary shielding if required, the unit is easily controlled. This means there is only a limited restriction on access to surrounding areas, so generally allowing other work or access to continue outside of the small inspection areas designated as controlled areas. The high power output and operating frequency of the MegaScanTM has practical advantages over conventional radiographic systems, as it produces very little scattered radiation. The MegaScanTM is electrically operated and it thus has the major advantage over the use of radioactive isotopes, in that it can be instantaneously turned off and made safe unlike an isotope. This is achieved either by switching off at the control unit or power supply, or by use of the remote hand held safety interlock switches by any member of the inspection team patrolling the controlled area. During the planning phase, careful consideration is given to the positioning of the MegaScanTM imaging head, as this will dictate the dimensions of the safety zones required. Typical planning distances and exposure times are shown in table 1 below. Where space is limited, safe distances can be greatly reduced by the use of lead or concrete screens as shielding. 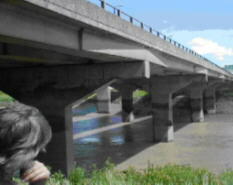 In the case of large bridge structures use is made of the bridge deck elements to act as shielding. Figure 3 clearly illustrates the conical shaped beam pattern of the MegaScanTM imaging head. The careful focusing of the main beam ensures that most of the output energy is efficiently directed from the front of the unit towards the capture plate. Safe distances to the rear and sides of the MegaScanTM imaging head are thus comparatively small. During the planning phase, advantage is taken of the beam pattern characteristics to optimise orientation of the MegaScanTM imaging head in order to reduce the size of controlled areas to a minimum. Figure 3: MegaScanTM imaging head safe distances and beam patterns. Planning the inspection of a large post-tensioned bridge is frequently governed by the need to ensure that any disruption to traffic flows above and below the bridge is kept to a minimum. The MegaScanTM imaging team have developed procedures and specialist equipment to ensure that such work may be carried out speedily during off-peak traffic flow conditions within safety zones provided by time limited lane closures. Figure 4 shows a typical site layout using the MegaScanTM Imaging Capture System to obtain images of tendons within the external web of a post-tensioned bridge. Typically, it is possible to maintain traffic flows on the opposite side of the concrete deck as illustrated by figure 4. Behind the MegaScanTM imaging head the safe working zone may typically be reduced to less than 5 metres, simply by the use of mobile shielding. Figure 4: Typical site layout. Proper planning, combined with specialist staff, equipment and procedures are the main inputs required for successful image acquisition. Figure 5: Positioning of MegaScanTM imaging head and capture plate. Image acquisition requires that the imaging head is placed adjacent to one side of the object under investigation, while the capture plate is located against the opposite side of the object as shown in figure 5 below. The distance between the imaging head and the object under investigation is important and depends on a number of parameters, each of which must be carefully assessed to ensure that the desired image quality is obtained. The imaging beam is emitted from a 0.6mm focal point through a rectangular shaped port on the front face of the imaging head as shown in figure 6. This feature enables the imaging head to be positioned close to the object under investigation whilst maintaining a good unsharpness value (good focus). This results in high image quality being achieved, while exposure times are significantly shorter than those required by other image capture systems. The image acquisition rate is important and the least amount of time spent on site obtaining images usually results in the lowest image unit cost being incurred. The way in which the imaging head is repositioned between image captures is carefully planned and use is made of conveyor systems and mobile elevating platforms to minimise time and effort expended. The MegaScanTM Imaging Capture System is fail safe in operation by virtue of the fact that when the electrical supply is cut, this immediately shuts down all components and terminates image capture. In addition, there is no residual radiation after use and the surface under investigation may be touched immediately, without risk. The MegaScanTM Imaging Capture System is configured according to the requirements of each individual task. For example in the case of a multicell post-tensioned bridge deck various configurations are possible as shown in figure 7. The configuration chosen to capture a given image will depend mainly on the location of the object being investigated and the proximity of people, traffic and trains. Figure 7: Typical MegaScanTM image acquisition configurations. Where high traffic flows prevent lane or carriageway closures, traffic lights or police controlled rolling blocks can be used to keep traffic away from a controlled area during image capture. In the case of an image capture which requires a long duration capture time, use may be made of the MegaScanTM integral power output monitoring feature which enables the operation to be carried out as a series of short duration image captures. Use of short duration image captures will reduce the length of traffic queues, especially if work is carried out during quiet overnight periods. Additional shielding may be provided to reduce controlled areas to a minimum by using materials such as lead, concrete blocks or water filled containers to create an enclosure around the imaging head. Where possible, the structure under inspection is utilised to provide shielding by putting the unit head inside the structure as shown in figure 7. Digital or fast capture plates can also be used as an additional safety benefit to either reduce capture times or the MegaScanTM power outputs. Major developments in the image capture system with regard to the quality and speed of capture, now ensure improved image clarity. In addition, images are usually ready for interpretation within ten minutes of capture. Image enhancement software is also available to further aid interpretation. The image capture process illustrated in figure 8, requires the MegaScanTM imaging head to generate a pulsed beam of radiation, which is focused on the object being imaged and through which the beam passes. The ability of the beam to pass through an object depends on the densities of the constituent parts of the object. Dense materials such as steel have a greater shielding effect on the beam than a less dense material such as timber. The image formed on the capture plate will be proportional to the degree of beam penetration achieved. Dense materials will result in clear image areas while less dense materials will result in dark areas on the resulting image. Figure 8: Process - Image acquisition. Through close collaboration between the MegaScanTM imaging team and industrial film manufacturers, a range of plate types is available to suit imaging demands. 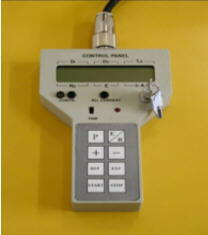 The range available varies from high speed, low contrast to slow speed, high contrast capture plates. The final choice of capture plate type will depend on the information to be obtained about the object being investigated. Fast capture plates are used mainly in the initial stages of an inspection to locate areas of interest. Use of a recently developed digital capture plate has enabled the MegaScanTM imaging team to achieve similar capture times to those required for conventional film plates. This has major cost saving and environmental advantages, given that a digital capture plate may be reused up to 4000 times before replacement is required. In addition, digital image enhancement may be carried out as the image is produced and this together with other features such as image dimensioning, image inversion, image annotation, archiving and digital image magnification make such a system invaluable on large projects. 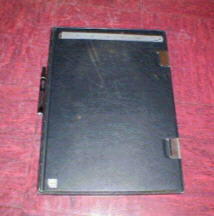 The film plate capture system may still in some instances result in the best method of image capture and assessment. The benefits of digital image manipulation may still be achieved with the film plate capture system, provided that each capture plate is digitised as a separate operation. To ensure consistent image interpretation, the MegaScanTM imaging team have developed specialist techniques to enhance the amount and quality of information which may be obtained from original unmodified images. Advanced computer software is used to augment image clarity and definition. As illustrated in figure 9, a significant improvement in image clarity is obtained when an unmodified image is subjected to effective enhancement techniques. Where a film plate capture system is used on a project, image interpretation usually commences with a visual examination of the image on a film viewer. At this stage an experienced interpreter will be able to establish most of the information contained in the image. In addition, the main features of the image are logged and regions of special interest are marked for subsequent detailed interpretation. Where a digital capture plate system is used initial interpretation will be computer screen based. Subsequent detailed interpretation of an image is usually carried out on a digitised image using software based specialist techniques. 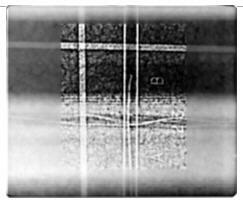 Generally such techniques will be focused on a region of interest as illustrated by the part-enhanced image in figure 10, which clearly shows a voided post-tensioning duct. Where feasible, use of a visual image to calibrate the captured image will greatly augment the image interpretation process. 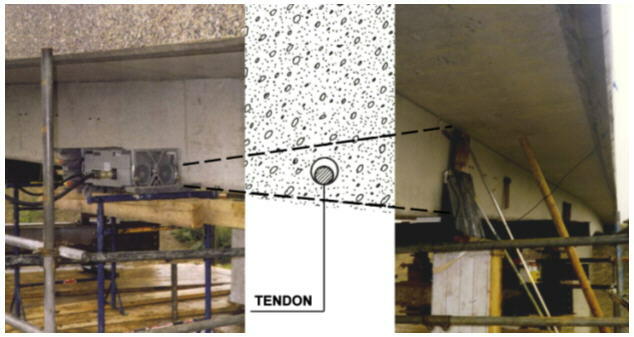 Figure 10: Comparison of unmodified, visual and part-enhanced images of a voided post-tensioning tendon duct. The MegaScanTM Imaging system is a powerful non-destructive testing method and should be viewed as an important part of the tool kit available to the structural investigation team. MegaScanTM Imaging will have greater influence if targeted on particular problem areas and if used in conjunction with other inspection methods. For example, ground penetrating radar has been used to initially locate post-tensioning ducts where engineering drawings are unavailable for a structure. Initial location work is usually followed by use of the MegaScanTM Imaging Capture System to verify the condition of the tendon and duct. Defects such as voids, incorrect positioning of tendons within a duct and broken wires can usually be readily identified. Such inspection work does not involve any damage to the structure and thus does not leave a weak point and possible source of future deterioration. As previously mentioned, in some cases the use of minor invasive investigation together with the use of an endoscope can be an invaluable way of calibrating results obtained using MegaScanTM Imaging. Such criteria can then be applied across the inspection and assessment of an entire structure. Figure 11: Comparison of images showing voided and fully grouted ducts. The MegaScanTM Imaging Capture System has been used to examine a significant number of tendons on a range of post-tensioned bridges. As figure 11 shows, the presence of voiding can be readily identified, in this instance indicated by the dark zone located just below the crown of the voided duct. As image capture is not an invasive investigation technique, voids and other defects can be rapidly located within the post-tensioning system using MegaScanTM Imaging. This ensures that a comprehensive overview of the condition of the post-tensioning system can be obtained without danger to the structure. This initial survey can be used to target further work, for example by defining lengths of voided duct which require subsequent re-grouting. Recent developments and testing of re-grouting techniques have enabled the re-grouting of voided tendon ducts to be carried out successfully. 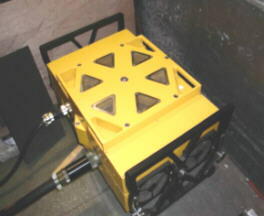 The MegaScanTM Imaging Capture System has played a prominent part in this work by initially locating and establishing the extent of voids within ducts. After completion of grout injection work, MegaScanTM Imaging has been used to provide further images of the duct. As shown in figure 12, the comparison of images before and after the re-grouting operation provide evidence of the success of the re-grouting operation. The MegaScanTM Imaging Capture System has been used to assist in the positioning of access and other holes prior to their formation through important structural concrete elements by establishing the positions and sizes of reinforcement as shown in figure 13. This procedure has also been used in the assessment of structures for which no engineering drawings are available. Another similar use has been to position cores used in the determination of in situ concrete stresses. A major advantage of MegaScanTM Imaging is that reinforcement in all layers within a section is shown on the captured image, which can also indicate the shape and end points of bars. To maximise the interpretation of the images it is important that the relative positions of the imaging head and the capture plate are known. Figure 14: Find the 40 000 Volt electrical cables ! The MegaScanTM Imaging Capture System has been used to position service runs located within structural elements. Such tasks are carried out without causing damage to the structure or service run. Figure 14 shows part of a composite concrete slab which contains an embedded 40 000 Volt electrical cable. 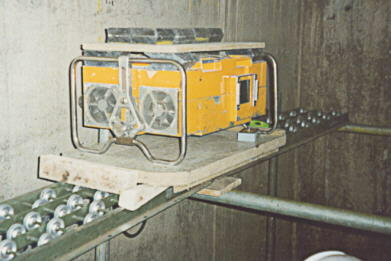 In this case the image was used to help position a coring rig prior to the formation of a vertical hole through the slab adjacent to the electrical cables. The MegaScanTM Imaging Capture System has been used to locate, establish and confirm the configuration of hidden details in a wide range of materials. Being able to obtain an image of a hidden detail, usually without any need to damage the structure, is of great importance to the assessment team. This is particularly the case where original construction drawings have been mislaid or are believed to be incorrect. Figure 15: Hidden joint examination using MegaScanTM imaging head and capture plate. MegaScanTM Imaging has been used to locate and examine post-tensioning anchorages and the reinforcement contained within both half-joints and hinge joints. 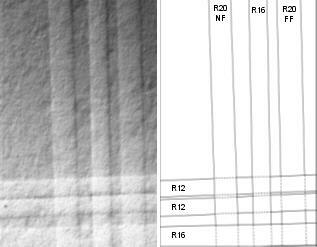 A useful feature of the imaging method is that details of non-structural reinforcement elements are obtained (see figure 13). 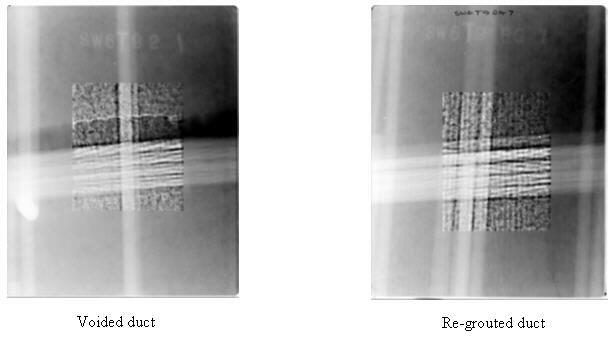 In addition, components which have been subjected to significant section loss can also be readily identified (see figure 9). The MegaScanTM Imaging Capture System can economically locate, identify and assist categorisation of defects within structural elements in a safe manner. MegaScanTM Imaging plays a major role in inspection systems for post-tensioned bridges and other major structures.